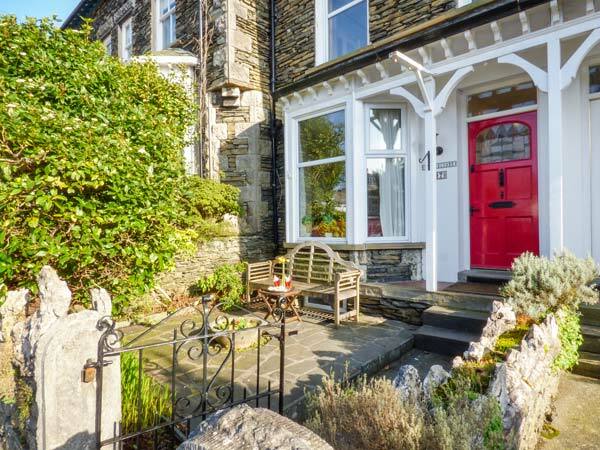 Gillercombe is a lovely mid-terrace cottage situated in the town of Bowness just five miles from Ambleside and can sleep eight people in one king-size double with en-suite, one double with en-suite and two twin bedrooms together with family bathroom and seperate cloakroom. Also in the cottage is a kitchen, dining room with electric fire and sitting room with electric fire. Outside is off road parking for two cars and front and rear enclosed patios with furniture. 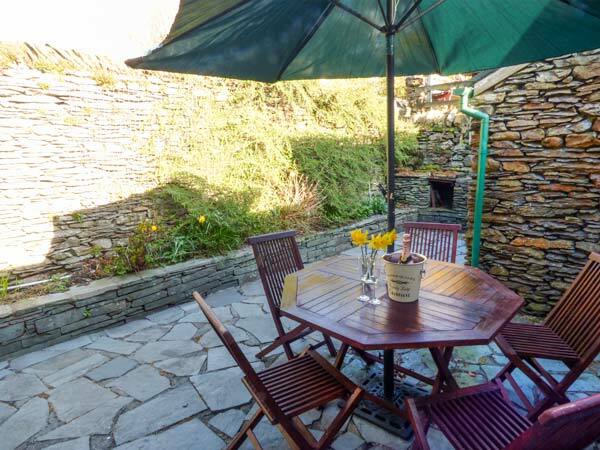 Gillercombe is a convenient base from which to explore this lovely part of the country. Over four floors. Four bedrooms: 1 x king-size double with TV and en-suite shower, basin and WC, 1 x second floor double with en-suite shower, basin and WC, 1 x twin, 1 x second floor 2' 6" twin. Bathroom with bath, shower over, basin and WC. Second floor basin and WC. Kitchen. Basement utility. Dining room with electric fire. Sitting room with electric fire. Gas central heating with electric fires. Electric oven and gas hob, microwave, 2 x fridges, freezer, washing machine, tumble dryer, dishwasher, 2 x TVs with FreeSat, DVD, WiFi. Selection of books, games, toys and DVDs. Fuel and power inc. in rent. Bed linen and towels inc. in rent. Travel cot, highchair and stairgate available. Off-road parking for 1 car. Front and rear enclosed patios with furniture. Sorry, no pets and no smoking. Shop and pub 5 mins walk. Note: Luxury membership included at The Burnside Hotel Spa which is 0.5 miles away from the property and it takes 10 minutes to walk there. The main pool includes: 2 Feature Hot Tubs, Steam Room. Sauna, Cold Plunge pool, Poolside Shower, Relaxing Poolside Seating, poolside Bar, Separate Male & Female Changing Rooms with Secure Lockers, Two Treatment Rooms & a Gym. Note: If you would like further information on the spa please see the 'The Burnside Hotel Spa' website.